Who Should I Believe ? WHO SHOULD YOU BELIEVE – NEITHER ! During and after a parents divorce the children should tell both of their parents that they do not want to hear anything negative about the other parent – it is not fair on them. Besides the child is half of the other parent they are trash talking and it makes them feel bad about them self. If doesn't matter if what they claim they are saying is true, it is still trash talking. Most people know that when you hear one person's side of the story in a dispute you are always inclined to believe them if you do not hear the other persons side of a dispute. People can be telling the truth, however just by selecting which bits of the story they tell you it can cause you to form a totally different opinion on the issue. The problem is much worse when the stakes are high and people exaggerate, bend the truth, tell outright lies or invent complete fabrications. The stress can sometimes cause people to become delusional and these stories will be even further removed from the truth. When faced with this potential impact every person will find it impossible not to distort their story to their friends and supporters in some minor way. Some will do it in an extreme way. For this reason it is imperative that children are not burdened hearing mummy or daddy's side of the divorce story. Sadly our adversarial divorce procedure puts way too much pressure on parents and many of them make their child their confidant telling them everything about their divorce. If this goes on for too long a role reversal known as Parentification occurs and the child psychologically becomes the parent. The Aligned Parent then often shares much adult information with the child such as very personal information about that parent's future intimate partners. This damages a child for life. I want you and my dad to be friends. 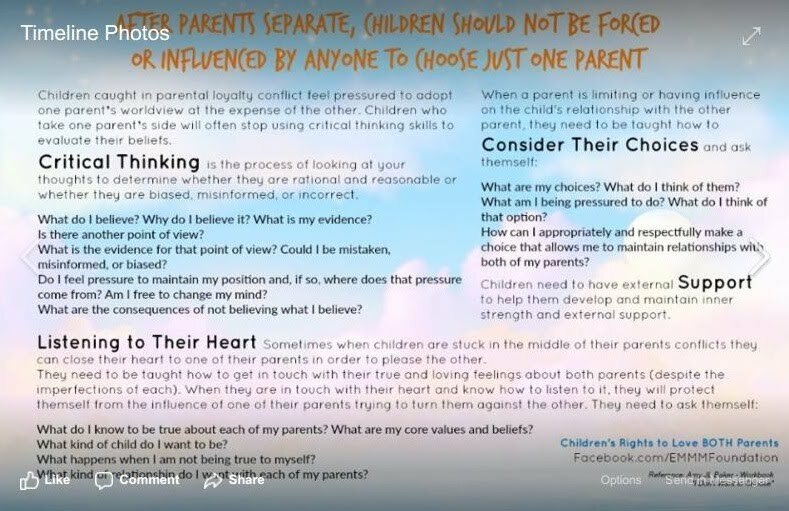 The writings on this website are based on information the author has learned from published literature by Parental Alienation professionals such as Psychologists, own experience and knowledge passed on by others. The information is generic and not about specific persons. The information on this website is not a substitute for professional advice and you should not rely on it. It is recommended that you seek professional advice before you take any action.